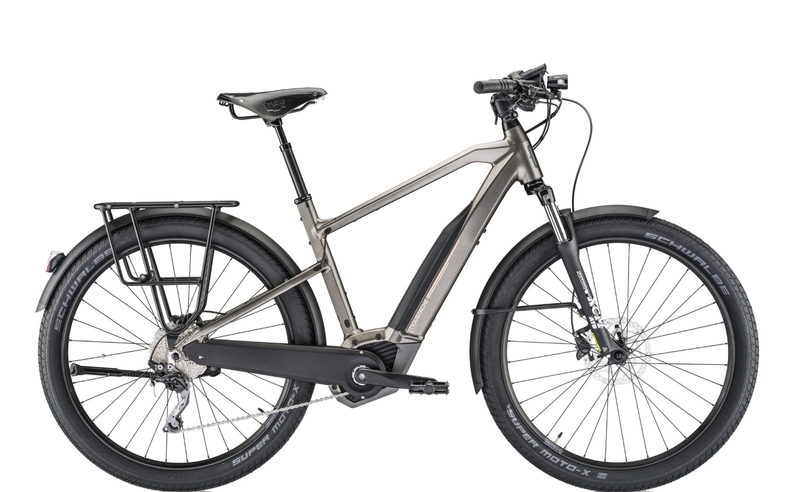 The Moustache Friday 27.3 is a 27.5″ touring e-bike suitable for both men and women seeking the perfect combination of comfort, quality and reliability. New for 2018 is battery integration, suspension forks and “Quick-Park” foldable handlebars at 90°! A practical commuting solution as well as a terrific e-bike for leisure, the Moustache Friday 27.3 delivers in every respect. Superb handling on both road and loose terrain means that this electric bike is a true champion whatever the challenge. With Schwalbe Super MotoX tyres, and a striking gun metal, hydro-formed frame in matt, this e-bike has looks that will turn every head. The Brooks B17 saddle on a suspension seat-post provides both elegance and comfort. The Friday 27.3 frame comprises variable thickness hydroformed tubes made of 6061 T4 T6 aluminium. The unique battery integration from Moustache uses exclusive technology, and is ultra-practical and high performance. Even integrated, the battery remains easy to install, easy to remove, and easy to carry. The 2018 model sees the introduction of a Quick-Park stem which allows the handlebars to rotate through 90° without any effort. This makes the Friday very easy to store in a narrow space! In addition, this workhorse of a bike boasts a new wider rear rack. It’s more stable and compatible with child seats and comes equipped with integrated QL3 mounts to attach Moustache ORTLIEB panniers in one simple click. Famous for its Moustache ergonomic handlebar, the Friday 27.3 is ultra cool and ultra comfortable. It has perfect balance, with a new Suntour XCM ATB reinforced fork comprising 80mm travel. Top that with Schwalbe Super MotoX Balloon tyres 27.5×2.35 and the bike filters out all the asphalt irregularities. The anti-puncture lining ensure hassle free rides. A Bosch Performance drive coupled with a large 400Wh battery provides a dynamic, powerful and captivating experience. Gearing is sharp and responsive thanks to a Shimano Deore 10-speed derailleur. Hill climbing is a breeze and effortless. Shimano M315 hydraulic disc brakes ensure a powerful and progressive response. The 180mm/160mm rotors prove more than ample. Low-consumption LED, high power lights from Axa and Pixéo are powered by the main battery, and ensure high visibility at all times. The Moustache Friday 27.3 is indeed a stylish and relentless performer.